The City of Boca Raton began to make a special effort to preserve the five miles of coastline and recognized that an outdoor, hands-on interpretive program would be extremely beneficial to the community. The City of Boca Raton purchased Red Reef Park in 1974 through a special Bond Referendum. The Greater Boca Raton Beach and Park District was created to retire the Bond, and provide for ongoing operations. The City of Boca Raton formed a permanent association with the Palm Beach County School Board to begin an environmental program at Spanish River Park. Mr. Gordon Gilbert began teaching environmental programs for students. 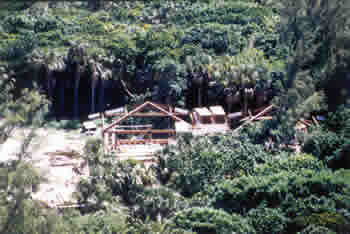 The master plan for Red Reef Park recommended the development of a nature center. A group of concerned citizens formed the Gumbo Limbo Friends of the Nature Center, an advisory and fundraising committee. The City of Boca Raton’s Sea Turtle Conservation Program began in Development Services. The auxiliary group, Gumbo Limbo Nature Center of South Palm Beach County, Inc., was formed from the Gumbo Limbo Friends of the Nature Center and registered its 501(c)(3) organization under Federal tax laws. The GBRBPD provided $750,000 to the Parks and Recreational Department (now Recreational Services) to build Gumbo Limbo Nature Center (GLNC). After completion and official dedication as GLNC, the public school environmental program moved from Spanish River Park to GLNC. The City entered into an agreement with Florida Atlantic University (FAU) for an easement deed for the purpose of maintaining future salt water lines (running from the Atlantic Ocean). A $200,000 project was completed that added a 1/3 mile boardwalk and tower to Gumbo Limbo. 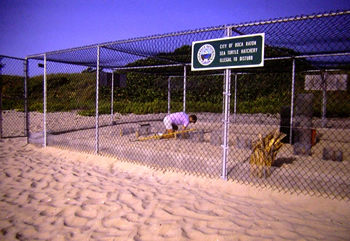 The Sea Turtle Conservation Program was transferred to Recreation Services and located at GLNC. 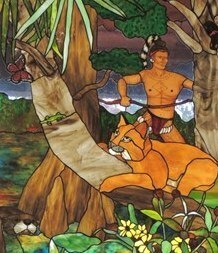 The Trustees of Gumbo Limbo commissioned artist Sharon Earl to design six stained glass windows to recapture the natural world of 1513. These windows were installed in the north side of the Nature Center. Gumbo Limbo received the Howland Award for Environmental Enhancement from the National League of Cities. An extension to the south end of Red Reef Park was added onto the existing boardwalk, and a boardwalk bridge connecting the Hammock to the tank area was completed. 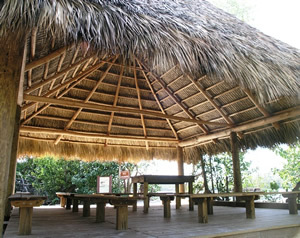 An outdoor classroom with an authentic chiki roof was constructed over the teaching platform near the Intracoastal Waterway along the Ashley Trail. A ceremony was held to honor the retirement of Mr. Gordon Gilbert, and the 20th Anniversary of Gumbo Limbo Nature Center was celebrated. The First Annual Sea Turtle Day was held to celebrate 30 years of sea turtle conservation and research in Boca Raton. A Sea Turtle Sculpture Garden depicting life-size representations of the seven species of sea turtles worldwide was completed. 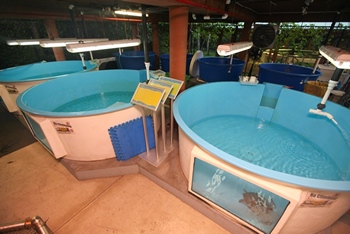 The Sea Turtle Rehabilitation Facility was permitted by the Fish and Wildlife Conservation Commission and opened. Cold weather takes a toll on Florida's sea turtle population, and the Rehabilitation Facility took in over 180 patients within the first few weeks of opening. New seawater tanks and pavilions were constructed, funded by the Greater Boca Raton Beach and Park District. Friends of Gumbo Limbo conducted the “Fill the Tanks” campaign to provide animals and habitats for the new seawater tanks. Phase One of the boardwalk renovation was completed, connecting the Nature Center to Red Reef Park West.